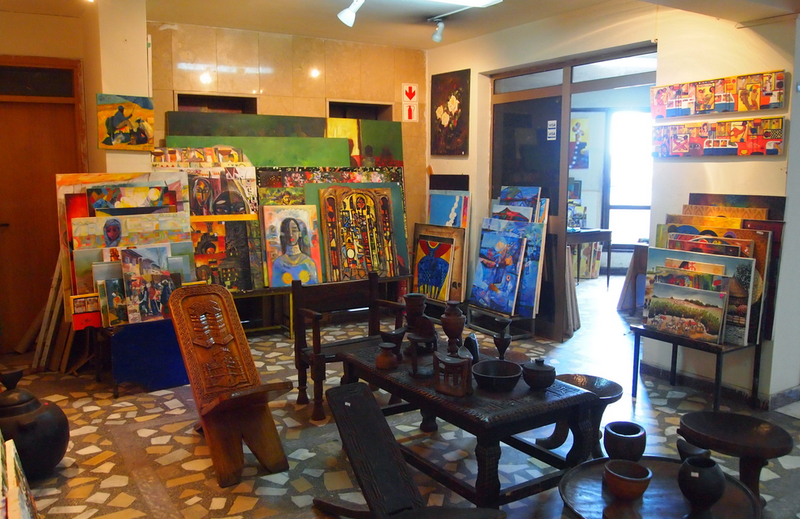 The African country bordering Sudan, Somalia, Kenya and Eritrea is not on every traveler’s must-see list. Landlocked on the Horn of Africa, it is not on any AARP travel destination. Politically and geologically rocky and diverse, Ethiopia can sometimes be hazardous to your health. But if you want an unconventional experience in a 3 million year old civilization, you might find old Abyssinia much like its Yirgacheffe coffee—spicy, dicey, romantic and bold. 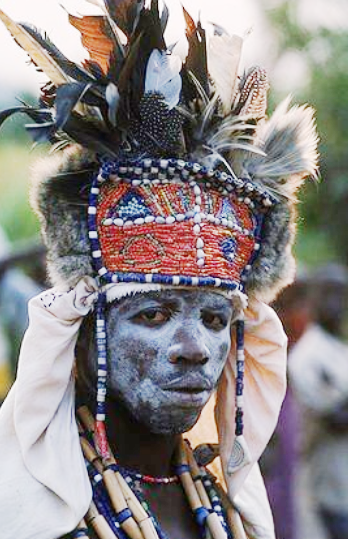 An old Abyssinian culture originally from what is modern-day Yemen, recent reconstruction of human prehistory from DNA studies trace Ethiopia’s beginnings to 1,000 BC. 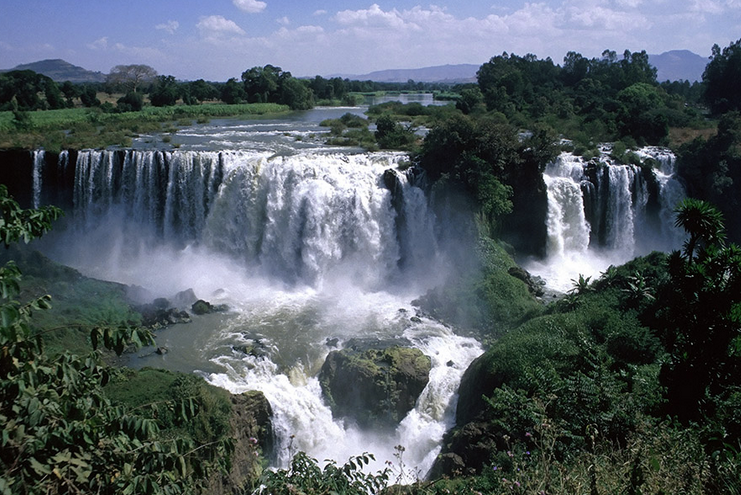 Composed of many ethnic tribes, the Oromo and Amhara are the most populous and the official language is Amharic. Since the cold blooded murder in 1975 of former Emperor Haile Selassi, strangled in the basement of his palace, Ethiopia has wavered between absolute rule by the God-King Selassi—to the totalitarian Marxist Militia that brutally executed him—to the present Ethiopian People's Revolutionary Democratic Front (EPRDF) with a prime minister and constitution. In the 1960s television had not yet come to this part of the world, and our embassy tennis courts were not lit at night. With the exception of one crowded disco, and one second rate hotel, there wasn’t much to do in the evenings. Getting around involved careful driving and cautious walking. With few street lamps, the city at night was a dark, deserted place where feral hyenas brazenly entered the city to prowl for anything they could get their noxious jaws around—living or dead. Hyenas are not particular about what they eat including humans when the victim happens to be sleeping in the street. But not to fear. A mysterious entity lived in our city—a bedraggled recluse who had an uncanny alliance with the nasty predators. Solitary and harmless, the man wandered the shadowy backstreets whistling, humming, virtually luring the animals out of town with bits of meat. They followed him like the Pied Piper. We called him “the hyena man,” and that is all we knew about him. Present day local “entrepreneurs” have made that bizarre experience into a thriving act performed for tourists. When we reached the falls, Walt didn’t fly over them—he flew into them. A breathtaking rainbow colored bridge to the sun filtered through the mist. I opened my window, took some shots and got a face full of water. Hair soaking wet, I wanted more photos so I asked Walt to make another pass. Peering up at me through dense foliage—the white-fringed face of a silky black and white long-tailed monkey. 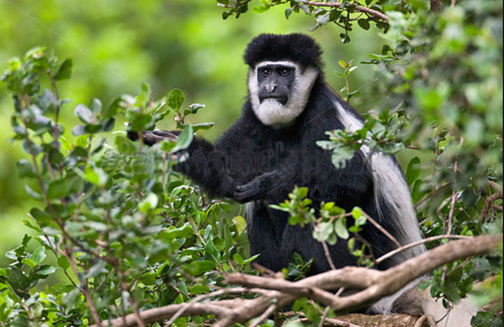 The elegant Colobus Monkey is the only kind of its species without a thumb, and a marvel of East Africa’s natural world. As we banked to head home, a barrage of bullets tore through the fuselage, zapping Walt in his bottom. We couldn’t see the gunmen but he knew they wanted the Cessna. Despite the pain, Walt wasn’t going to let anyone have his aircraft—or us as hostages. With Walt screaming obscenities and me praying, he managed to hold the aircraft steady while his blood leaked into the floorboards. 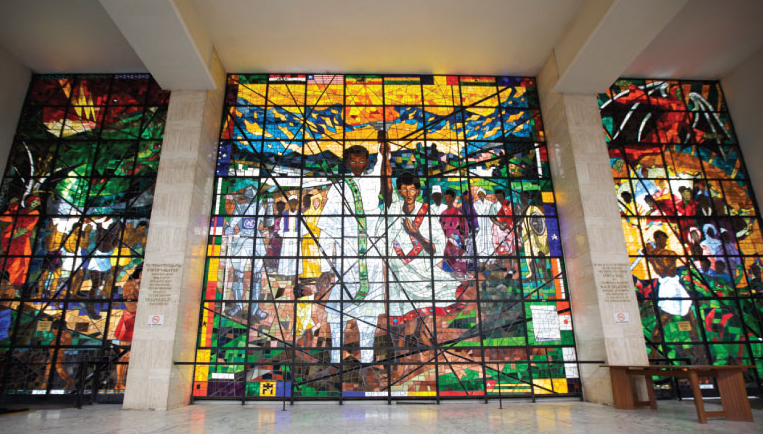 We made it back to Bahir Dar with Walt’s pride as wounded as his anatomy. After medical attention and a few belts of his personal Johnnie Walker Black, the bush pilot was back on cloud nine. Some 400 miles from Addis is the city of Lalibela whose airport terminal in 1966 was a tin roofed hut. 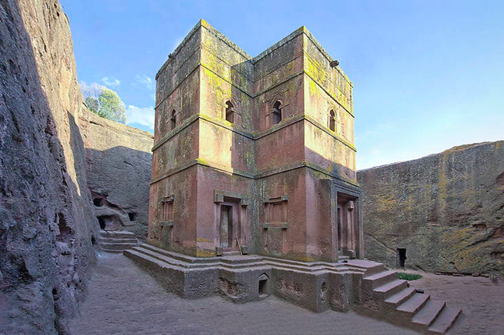 Here in the 13th century King Lalibela ordered construction of twelve monolithic churches. His intention was to construct (and conceal under ground) a 'New Jerusalem’ after Muslim conquests halted Christian pilgrimages to the Holy Land. Unlike the pyramids built with quarried stone blocks, these medieval churches were carved by skilled craftsmen out of solid living rock. Originally concealed deep under ground, the churches remain holy places of Ethiopian Orthodox Christian pilgrimage. More accessible to pilgrims today, I had to crawl on my hands and knees to reach a subterranean darkness. Once there, I was transported to the Middle Ages. In the dim shadows a priest stood holding a torch in front of an altar surrounded by well preserved religious wall paintings. He looked like he’d been standing there for 500 years! The monks tell you the Ark of the Covenant is similarly hidden in a monastery in the ancient kingdom of Axum, where Queen Sheba lived among the obelisks in the 10th century BC. 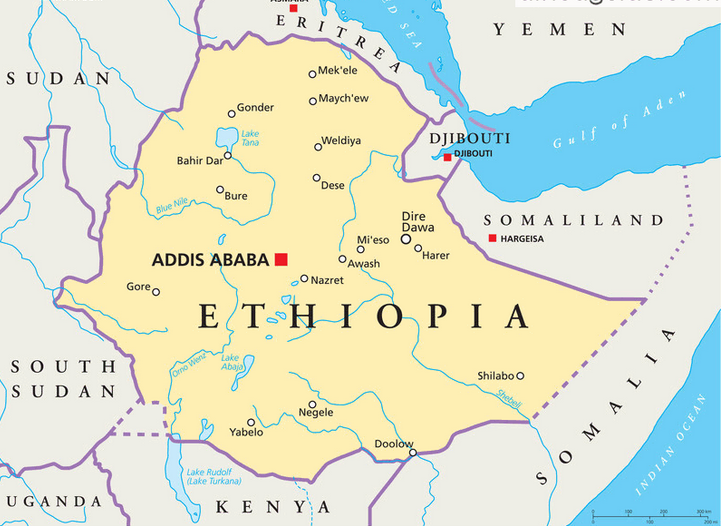 A powerful empire in northern Ethiopia, Axum played a vital role in international trade from the 1st century until the latter part of the 1st millennium I(100—940 CE). Ethiopia is indeed the old land of legends that Indy Jones missed. Though we spent considerable time at work or on embassy tennis courts, how long can you stay in a place that has one disco, no streetlights and hyenas lurking in the shadows? My friend Henry was a stringer for the Associated Press based in Addis and we backpacked often. When he learned that two Yugoslav brothers, Alek and Jan Rankoviç, made their living hunting crocodiles on the Baro River, he thought it would make a good story and a fun trip. Ravenous jaws of hyenas and snapping mandibles of crocs are not my idea of fun. But Henry's considerable coaxing convinced me to join him and Joe Frankel, a Coca Cola agent, for a safari to the South Sudan-Ethiopia border. Two Ethiopian friends from my office joined us. Relatively quiet in 1965, today our embassy will advise you not to go there. It was dark on the river when we scrambled into several small boats—just we humans and the insects. I noticed the hunters had razor sharp pointed teeth that made them look ferocious. They carried lanterns and thick heavy clubs. Soon the river was swarming with crocodiles attracted to the lanterns. The lights hypnotized the animals long enough for the men to club them between the eyes. After stunning the crocs, they shot them once so as not to damage the skins. The scene was bloody and nauseating and I threw up over the side of the boat. Although crocodiles are not my favorite wildlife, it was too much for my stomach. I always regretted witnessing that mercenary slaughter, which today in Africa has reached unimaginable proportions among all animal species. The final night, asleep in our camp beds, I awakened to a strange monotonous drone. Through the mosquito netting I saw two Anuak men with ornate headdresses sitting beside a small fire. They were chanting and throwing amulets into the flames. Henry had heard them too when he reached out his hand to mine. “Don’t worry,” he whispered. “They’re medicine men sending us protection for a safe journey home.” And it was. See the PBS series, AFRICA’S GREAT CIVILIZATIONS with Henry Louis Gates, Jr.